The KBIC Medical Clinic features two full-time family Practice Physicians, a full- time Family Nurse Practitioner and a part-time Pediatrician. Patients can schedule appointments in advance for well child visits, medication renewals, annual physical, or chronic care visits (diabetes, asthma, heart disease) or can call for same day appointments for acute illnesses such as ear infections, colds, flu or injuries. A Women’s Health Clinic is held weekly, our Nurse Practitioner is available to provide routine exams and family planning services. As primary care providers our physicians work with you to manage diagnosed health conditions and provide preventive services such as recommended screenings and immunizations. 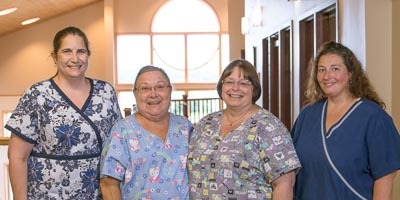 A full nursing staff works with our physicians to provide comprehensive care. The patient portal is a secure online website that gives patients convenient 24-hour access to personal health information from anywhere with an internet connection. Using a secure username and password, patients can view health information. With patient portal implementation, we will enhance patient-provider communication, empower patients, support care between visits, and improve patient outcomes. Features include - Message your physician, view your health records, request appointments, view test results, request prescription refills, complete pre-visit forms, and request access to your child's health information. Urgent Care: Injuries such as sprains, laceration repair and other acute illness. Clinic hours are Monday through Friday 8am-4:30pm; Tuesday and Thursday mornings are reserved for lab draws. Medical has a full-time medical receptionist to assist the community with scheduling medical appointments.